CoconutsPark - Buuka of Southern Island: Episode 42 is another point and click type room escape game by Coconuts Park. In this game, you try to find the items and solve puzzles to finish the game. Good luck and have fun! solve cabinet outside to get blue box... use key to get candy cane disc and paper solve other side of cabinet (use left side clue paper from blue box, with cans) to get a green box. the order for the cans to be used on the right side, which you obtained from the left side box. ok i worked it for any one else stuck use the ist letter of each fruit ( paper with fruit on it )in order it shows on right side of cupboard outside. I predict the next episode will have us looking for a helmet for the pigs to wear while skateboarding. Thank you Shaz for your hints. I don't get the order of the buttons for the green box. It's not the number of candies in each jar, it's not the order of the jars on the shelf. @pdgph: it's not an order! Just hit each button once for each candy, so 4x, 3x, 2x. I'm pretty sure my buttons went in w/ the order of jars on shelf. Then they got stuck and lit up when I clicked them. Now the neighbor and his nephew (don't know their names) come over and see them struggling, and probably are laughing at them, so now they've been HUMILIATED in front of company and only YOU can help them. 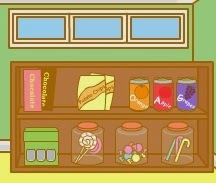 Move aside the chocolate bars for CANDY COIN 1 and note the Orange, Apple and Grape sodas. Set the color code box in the order of the sodas L-R for a KEY. Back out, notice the time (it's late), then click on the door and go outside. Enter clock time on the shed's L door to get a LOCKBOX. Open with your KEY for CANDY COIN 2 and a COLOR CLUE. for that is the sequence to open the cabinet inside. Do this and acquire CANDY COIN 3. Install your COINS in the same L-R order as the jars on the shelf (yes this works) then press the buttons 2, 4 and 3 times, acc. to the number of candies in each jar. Get OIL.